The college celebrated Veterans Day with several events to honor those who have served in the armed forces. The Columbia College drumline was in the Veterans Day parade Sunday. 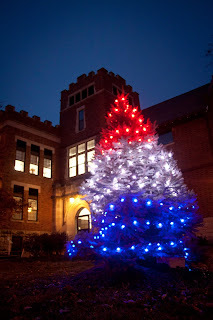 The main campus events culminated in the tree-lighting ceremony Nov. 11. KOMU 8 broadcasted live from the Columbia College campus to preview the ceremony and talk about the struggles and transitions veterans face. We hope you joined us for these events!